When fall comes around, butternut squash soup is the perfect comfort food to warm you up. Soup is one great way to enjoy this hearty fruit (yes it is a fruit). It’s a perfect starter for Thanksgiving or any special dinner. There are many variations to this soup, so let your creative juices flow. For example you can add roasted peppers, and oregano for a Mexican flair. Or cinnamon, cloves, and nutmeg for a Christmas side dish. Other variations include curry and/or apple depending on your tastes. Before I get you started with our butternut squash soup recipe, I want to mention that butternut squash is a little bit awkward to work with because they are rather large, heavy and a bit challenging to cut. To make this soup, there are at least 3 ways to approach this. Cut the squash in half length-wise, scoop out the seeds, and brush with olive oil. Lay the squash face down on a baking sheet and bake for 40 minutes, or until tender, at 350 degrees F. When it’s tender, you just scoop out the flesh. If you are really handy with a knife, cut both ends of the squash off. Then cut the squash in half just above the bulb. Now cut each half lengthwise. Scoop out the seeds with a spoon. Cut the skin off with a knife, carefully. It’s very similar to cutting up a fresh pineapple. Once the skin is off, cut the squash into one inch cubes. Take a baking sheet lined with foil and spray it with a coating of Pam spray. Place the squash cubes on the tray and bake for 40 minutes at 375 degrees F. or until tender. So how do you pick a ripe butternut squash? Last time I was at the store, I noticed all the butter nut squash looked good. Pick one that has the fewest blemishes, is heavy for it’s size, and has an even yellowish-tan color. Avoid any with mold or soft spots. If you have a farmer’s market in your area, shop there first. It doesn’t get any fresher than this. You can store the squash in a cool dry location (not in the refrigerator) for about a month, maybe two. Also, I wanted to mention that my recipe calls for a half a cup of whole milk. That’s to help make it more creamy and rich. Some recipes call for heavy cream but I just couldn’t go there. I don’t think heavy cream is really necessary and who wants all that fat? If you decide you want to omit the milk all together, the soup will be just fine without it. You probably won’t even miss it with all those other ingredients imparting their great flavors. 2 leek stalks, rinsed, slice white and tender green part. The first thing you want to do before starting this butternut squash soup recipe is to take a whole bulb of garlic, cut off the tip and place it on a piece of foil. Drizzle a little olive oil on top and seal up the foil around the garlic. Place in a 375 degree F. oven for 45 to 60 minutes or until the garlic is golden brown and the cloves are very tender. Boy, are you going to love the smell of this cooking. While the garlic is cooking away, prepare your butternut squash as I mentioned above. Approximately 1lb. of cooked squash equals 1 cup of cooked squash. Saute the apple, celery, thyme, and leeks in the oil and butter for 25 minutes. Then remove the thyme if using fresh. In a stock pot, add the chicken broth, roasted garlic, squash, and nutmeg on low heat. Be careful when you add the garlic as it will be very hot. Just squeeze each clove right into the pot. Then add the apple/celery mixture to the stock pot and simmer for 10 to 15 minutes. Salt and pepper to taste. Add the milk and stir until blended and heated through. 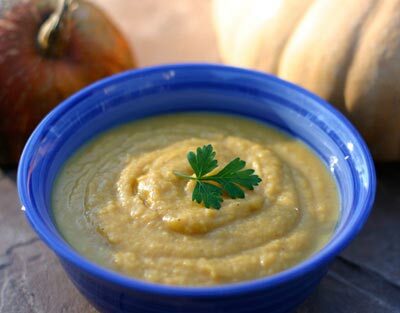 If you have an imersion blender, now is the time to puree this butternut squash soup. A blender works too. With the blender you will have to puree a small batch at a time. Again, be careful as you are working with hot soup. You can top this butternut squash soup with a dollop of sour cream, or yogurt if you like. If you want or need to substitute some extra vegetables you can. Last time I made this soup, I had a small butternut squash. Not really enough to make the recipe. But, I did have a nice big yam laying on the counter. So, I added the yam to the recipe and it turned out great. You could add carrots too if you want. This soup is really easy to substitute with so don’t be afraid to do that. This is a real comfort soup and a great starter for any meal. Back to roasted vegetable recipe for more healthy vegetable recipes for you to try.